Contains Organic ingredients and is FREE FROM fluoride, genetically engineered ingredients, carrageenan or other potentially carcinogenic ingredients, synthetic preservatives, heavy metals, contaminants or impurities, harsh chemical foaming agents like SLS or SLES, artificial flavors or sweeteners, harsh sand (silica), potentially dangerous antimicrobials like Triclosan. 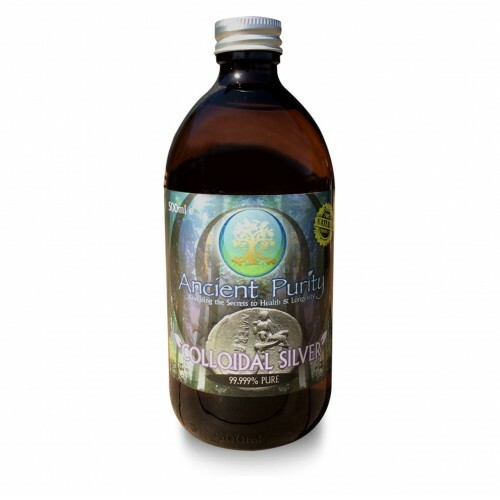 It provides dazzling whiteness, fresh breath, clean teeth and gums, whiteness, and a beneficial balance of healthy mouth flora. 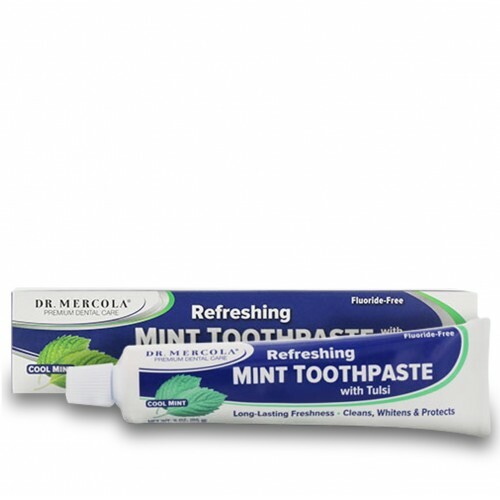 Dr Mercola has now come up with a toothpaste that was even better than the original—one that would give you refreshingly clean teeth and breath, provide whiteness, and effectively fight and prevent caries (all types of tooth decay) without carrageenan. Just because many "natural" toothpastes contain carrageenan, SLS, and other potentially harmful ingredients, mine didn’t need to. Let me assure you, creating it wasn’t a simple task. My team and I spent countless hours researching ingredients to take my original toothpaste to the next level. Sounds like a tall order, doesn’t it? That’s why it took us as long as it did to formulate my Refreshing Mint Toothpaste With Tulsi. I’m proud of our accomplishment. 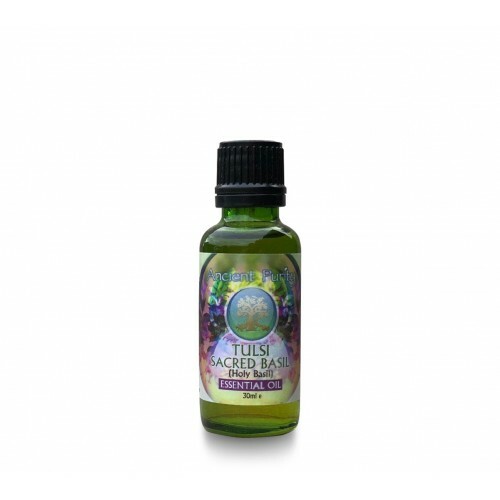 Organic Melaleuca alternifolia (Tea Tree) Leaf Oil – Promotes clean teeth and gums and helps reduce normal plaque accumulation. 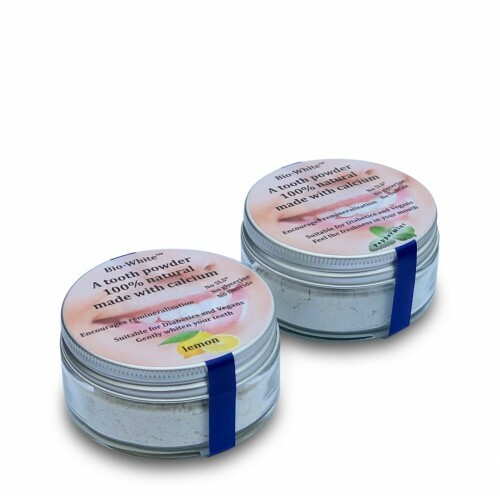 Traditionally used topically for skin care. I know it’s a long list, but I wanted to make sure you had everything you need for complete dental care. Instead of using potentially dangerous ingredients, I turned to botanicals to provide cleaning of teeth and gums and whiteness. One in particular, Holy Basil, or Tulsi, has held my attention for many years as an outstanding overall tonic for health. I believe it’s one of the finest medicinal herbs ever discovered. Evidently, people in India agree. As part of an ancient custom, family members worship the plant and illuminate it with lamps twice a day. To this day, Holy Basil plays an essential role in worship ceremonies. People believe it protects them from evil and brings good luck. As for oral care, Tulsi is an exceptional mouth freshener and cleanser, and helps support a beneficial balance of healthy mouth flora. It also helps prevent dental caries while it soothes your mouth. 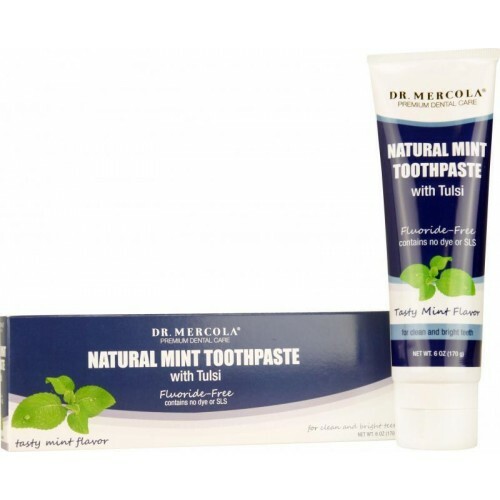 While my Refreshing Mint Toothpaste With Tulsi contains several excellent plant extracts for cleaning teeth and gums, fighting caries, and freshening breath, in my opinion, Tulsi is the crowning glory. Perhaps you’re wondering how my Refreshing Mint Toothpaste With Tulsi compares to other fluoride-free toothpastes. Here’s mine side-to-side three of the top selling "natural" brands. Maybe you are using one of them now? It’s up to you. No one else is going to watch out for your oral health when it comes to toothpaste, perhaps not even your dentist. Now that you know what’s in your tube of toothpaste, you can decide what’s best for you and your family. You can choose a toothpaste that contains potentially hazardous ingredients. Or you can choose one that cleans and freshens your teeth, gums, and breath, and prevents dental caries with botanicals and ingredients that meet my strict standards. I know you and your entire family will enjoy brushing with my Refreshing Mint Toothpaste With Tulsi. And you’ll appreciate knowing you’re making a wise decision to help safeguard your family’s oral health. Plus, Refreshing Mint Toothpaste With Tulsi comes packed in the perfect size for both everyday use and travel. Our convenient 3-ounce size tube provides about 150 to 200 servings per tube! Essential Oil blend - (peppermint, eucalyptus, cardamom, anise). Natural sodium laurel lactylate (from coconut oil and vegetable lactic acid). Carageenan (from red seaweed extract). Xylitol - From Birch Trees. Brush teeth thoroughly after meals or at least twice per day. Cautions: Keep out of reach of children and pets. Do not use for pets. Discontinue use if signs of irritation occur. Avoid contact with eyes. If product gets in your eye, hold eye open and gently flush with water for several minutes. A - It is recommended for ages 4 and up. A - There is no warning against this.